First to create a digital artwork tied to the blockchain that changes its representation based on what machine it is displayed on. Is Pepe the Frog an Alt-Right Hate Symbol? Jason: I know it can be difficult to explain blockchain to someone who doesn't understand it - it is a difficult starting point to begin with. But then to get through that and then explain Rare Pepe and Pepe the Frog vis-à-vis some of his more negative history, it's a lot to try to deal with up front, right? I'm curious when you're asked about that, how you describe the Rare Pepe community vis-à-vis the negative press. Joe: It's almost like how when I explain Bitcoin to people now. If they are just going to dismiss it, then I'm not that bothered, but if someone's actually interested, then I'll take the time to try to pass some knowledge on to them of what I've learned. I mean, there's obviously some Pepes that are pretty horrible, but it's like, you can make Pepe whatever you want. So people that are horrible are going to make horrible Pepes. But yeah, it's funny because Rare Pepe actually started right around the time that -- it almost happened like right after early September, 2016, when Mike, who is the guy who created the first Pepe in counterparty added it to the Telegram chat. I think Hillary Clinton coming out and saying Pepe is a hate symbol was like three days later; like, it was right afterwards. So it was almost like, here's this awesome thing, let's do it! And then it's like, aww, someone ruined Pepe! But I don't think they ruined it totally - just in the public eye in that time, but really, I think it's kind of fading away. I think that thought process is fading, it's like old news now. Was Rare Pepe Wallet the First Blockchain CryptoArt Application? Jason: From talking to people at the Rare Digital Art Festival, I get the impression in the CryptoArt world or the blockchain art world that Rare Pepe was really the first. Is that right? Joe: The first one was actually Spells of Genesis. I think the main difference between Spells of Genesis and Rare Pepe Wallet was you couldn't make your own card in Spells of Genesis. It was just that company making them. So I think it's probably fair to say that Rare Pepe was the second. I can't think of any other project that was prior to Rare Pepe and after Spells of Genesis. We changed it a little bit so you could make your own. That got people excited right away. We have a Telegram chat which is where it started. So there's kind of like a communal area where everybody can go, hang out and post memes and talk about Rare Pepes, and then the Wallet. 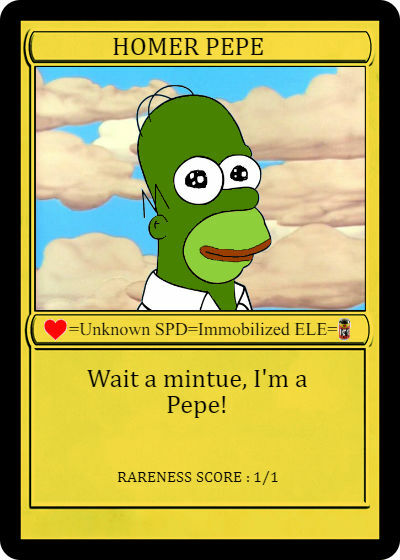 So there is an easy way to collect your Pepes - they look like trading cards, you can flip them around, you can trade them really easily on the Counterparty Decentralized Exchange (or the Dex). All those things together made it take off, and that group grew really fast, that Telegram group. I think there were over a thousand people within a couple of months, and it's just grown since then. Jason: So it was the first platform that allowed for user-submitted artworks, or trading cards, on the blockchain? Joe: Yeah, that's the way I explain it to people. Like, the quick, one-sentence description is they are just digital trading cards. And then you can expand on that; you can talk about Bitcoin, you can talk about all sorts of stuff, but you just start with digital trading cards and everyone can understand that. What are Some Major Innovations Attributable to Rare Pepe Wallet? Jason: The big thing that jumped out for me from your presentation was when you started demoing the video game and the song that were tied to specific Rare Pepe cards. Is that something that a lot of people are doing already and you sort of brought it to Rare Pepe? How did this idea that you can have one-of-a-kind content beyond just the visual card going into games and music and whatnot evolve? Joe: The idea of an access token has been around in the Counterparty community, which is the platform that Rare Pepe is built on top of. For a while, there have been people trying to come up with ideas of applications using an access token. To be honest, I don't know if I heard someone talk about it or something or if I came up with it. I don't know. I don't remember. But this idea that you can have this token and you can prove that you own it, and so you can actually prove digitally that you own it, and through an API. So the first thing that comes to mind is extra-bonus content, an extra area you can get into -- kind of like a VIP pass that lets you in somewhere. I've never charged artists to put bonus content in the wallet. It's always just like, "hey guys, if you want to put something in there let me know and I can link to it or mask it." But with the SoundCloud links, the way we set up is to mask it a little bit so that you can't share that link because it's actually -- actually, I have it set up where it bounces off... I can get into technically how it works, if you want? I don't know how technical you want me to get, but essentially, you couldn't share that link because it's kind of tied to your computer. 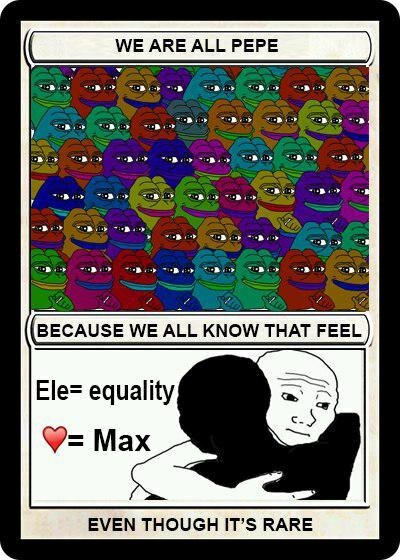 Rare Pepe Gift Card Sent to me by Joe Looney containing SCHROEPEPE. SCHROEPEPE - The Schroepepe is simultaneously alive and dead. It appears differently based on which device it is displayed on. Another feature that I have that you probably don't know about is you can create Rare Pepe gift cards. It's a feature that isn't really used a lot now since the Bitcoin transaction fees have skyrocketed in the last couple of months. But when the fee was a dollar or two, what you could do is you could create these gift cards and they actually look like gift cards -- it's kind of a Pepe in the middle and a nice border. I made a happy holidays one and handed it out before Christmas, 2016. When you create a gift card, you send the Pepe to another address that you just create at that moment and the private key is encoded as the gift card's secret code. And it costs two transaction fees, because what you do is you send the Pepe to the gift card with another transaction fee so that whoever you give the gift card to can redeem it within the Wallet, and when they redeem it, it basically just uses that private key -- that's the secret code on the gift card -- to send the Pepe to them, and there’s already enough Bitcoin to do that. So the whole idea was the way you could get new people into Pepe is you literally just give them this gift card, they go to the website, type in a code, and it sends them to Pepe, and they have it. They don't need to get Bitcoin, they don't need to do anything. So it was kind of a way to spread the word of Rare Pepe and give this gift card and the person that gets it. Literally all they need to be able to do is go to a website and type in the code on the card, like you would do with any gift card. How do I submit a Rare Pepe to the Rare Pepe Wallet? 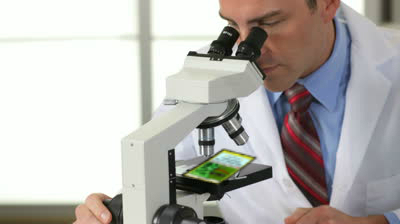 Rare Pepe Template is offered but not required. Instructions note: "It doesn't have to look like a trading card at all". Jason: When people submit artwork or Pepe cards, do they pay a fee and then you or Mike or someone kind of reviews them and accepts them? What’s that process looks like? Joe: So they don't pay us a fee, they burn their fee. So that's another interesting thing with cryptocurrencies which then applies to these digital assets, is that you can provably destroy them. And the way that works is you can create an address or you create the public key without a private key and it's -- I don't know if you've ever seen a burn address, but it basically looks like a Bitcoin address, but it'll be a number one and then it'll be, like, words that are recognizable, like "Number one, this is a burn address, and then a bunch of X’s after it", so you know that address wasn't randomly created. So it is as secure as your Bitcoin address is, it is as secure as that thing is destroyed. Jason: Got it. 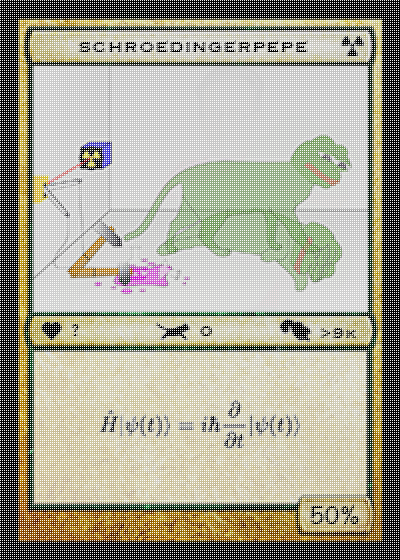 And the purpose of destroying the token versus -- so if I want to submit my Pepe trading card art to you. Instead of giving you money, I destroy a token? Why? Joe: It's interesting because the Rare Pepe Foundation is really just a group of seven of us that have been around basically since the beginning, and we realized really quickly that we needed to curate and have very basic rules or it was just going to get out of hand really quickly. So that's what we did is create the “Rare Pepe Foundation,” but there's no real “Rare Pepe Foundation.” Like, there's no actual legal entity, we just call it that. It's just a small group of us. Rare Pepe Directory, which is a site that Mike put together, has a list of rules if you wanted to look at them. They're really basic. It's just a spam filter. We're not trying to judge people's art and say we think this is good art and this is bad art. It's just really kind of basic rule set and it is very subjective, but we try to stick to the rules so that we can be less subjective. Rare Pepe Foundation. Also Known as the "Scientists". Jason: Safe to say you don't filter for artistic content like quality or skill or whatever, right? I'm just looking through the rules. I see there is a NSFW [not-safe-for-work] rule? Joe: Yeah, so one of the rules is no NSFW content. So the idea is we didn’t want to scare people away. It's really just no not-safe-for-work content. Some of them can get a little borderline. At the end of the day, I have to run this Wallet, so if I don't like it for whatever reason, it's not going to be in there. But we're not trying to judge people’s art. The idea was, we have a small enough group, we're all on the same page, and we keep out the ones that are very questionable. And then we have gotten some where it's like somebody literally took five seconds, went into Microsoft Paint, and drew a Pepe. So we'll say that low-effort Pepes are not going to be accepted. We do some curation there, but I have to say that if you go through and start from series one and go all the way to series 30, you'll see the quality -- we definitely attracted real artists, and the quality of Pepes has gotten really good. There's some really, really good ones that people definitely spent a lot of time and are very talented artists. 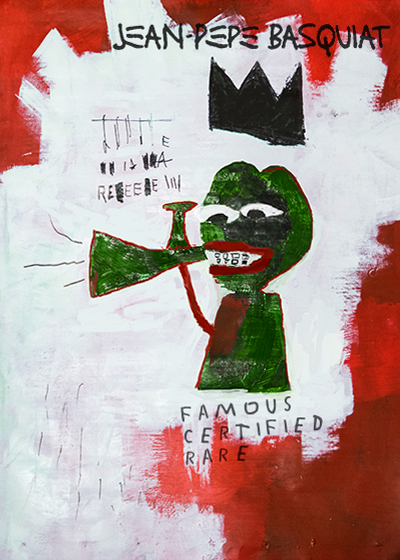 Who are Some Important Rare Pepe Artists? Jason: Who are some of the Rare Pepe artists I should check out? Joe: I do have my favorites. DaVinci -- which was actually one of the auctions at the festival -- those Japanese ones that were like little cartoon Pepe guy in all different situations. Those are some of my favorites. DaVinci, the artist, he's Japanese and he has a little shop. He sells drones and random stuff with his little characters on them. So I bought a Pepe keychain and -- let's see who else I like -- DaVinci is probably one of my favorites. Scrilla has really good Pepes. He's done a lot. You can tell his style, like, if you're going through the Pepes and you've seen one that he's done, you'll notice him as you click through after that. 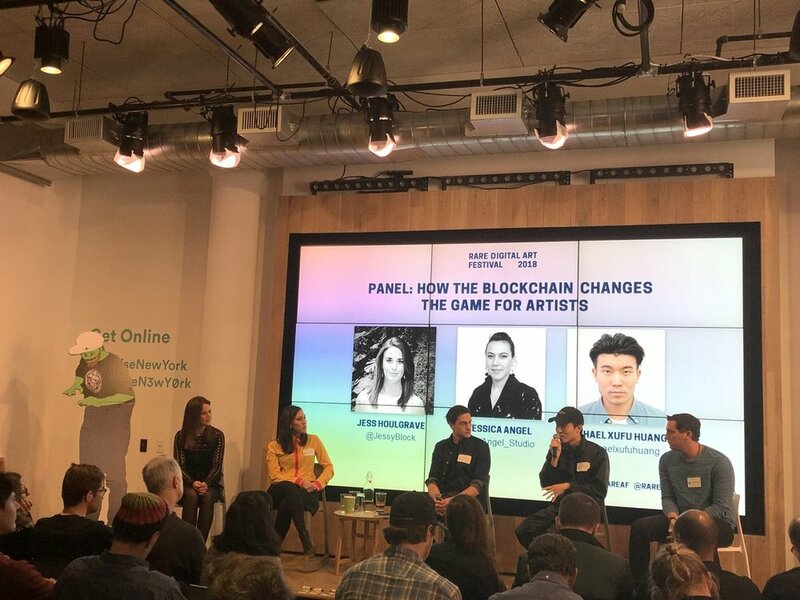 What are the advantages of collecting digital blockchain art vs traditional physical art? Jason: Is it fair to say what you are doing with Rare Pepe Wallet could translate to the traditional “non-digital” art world? Joe: Yeah. Well, I think there was a big distinction between trying to pair physical art with a token and then having that token be the art. I try to really harp on that with Rare Pepe stuff because, in my opinion, the token is part of the art in that the image is just what it looks like -- that thing you're collecting. But imagine if -- and this is even more interesting, with Rare Pepe, especially -- if 10 to 15 years from now, say Rare Pepe Wallet is not around anymore, Rare Pepe Directory is not around anymore; as long as Bitcoin is around, your Rare Pepe is still around, and maybe there's some that the image gets lost and now it's a really rare Pepe because no one even has the image for it. Jason: No one knows what it looks like. Joe: Yeah, no one knows what it looks like. In my opinion, it's really the token that you're collecting and the kind of legend behind the token. Like, when I see Rare Pepe, it's kind of like, this is a moment in time in internet history where we first discovered that you can kind of use these digital assets and collect them. And they can be this collectible, fun thing, this whole ecosystem built around it. So I think you run into trouble when you try to pair that digital thing with a physical thing, but in the case of Rare Pepe, it exists digitally only. Any physical manifestation of it is just -- it's just an additional thing, like the six-foot tall DJ Pepe cardboard cut out at the conference. 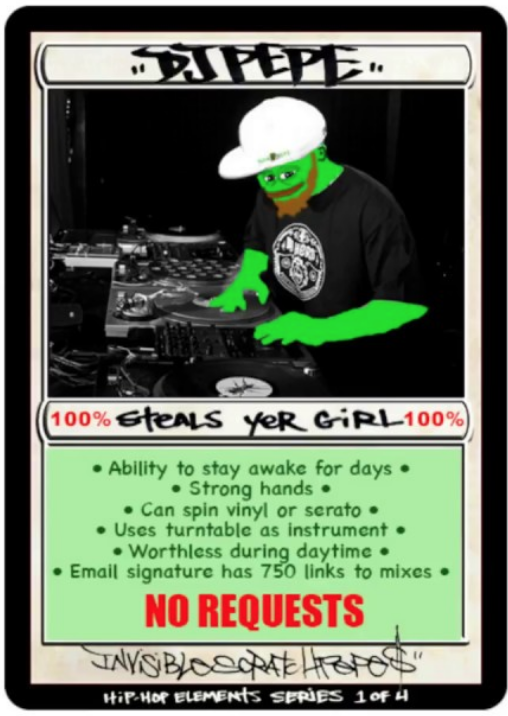 That cutout went to the highest bidder on the DJ Pepe cards. Jason: That's almost like the song or the video game example you gave where it's an auxiliary to the core part which is the coin or the token, right? Joe: Yeah, exactly. 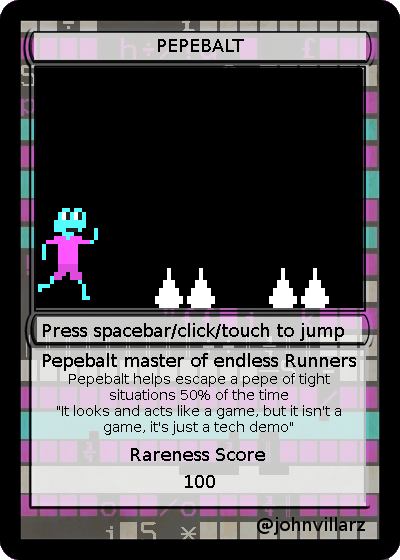 So I think that's one thing that has been demonstrated -- there's a game called Sarotubi where you basically link your address to your player profile, your CounterParty address, or Rare Pepe address that holds your assets -- and then you have the ability to create these monsters from your Rare Pepes, and it kind of uses the card image and makes these monster things and stuff. There's so many things you can do because it's like, what can you do with a physical piece of art or collectible or trading card. It's very minimal to what you can do with a digital one because you have so many options now with how you can interact with it. Another thing that I demonstrated during my demo was the OpenDime Pepes, which was the physical Pepe. I thought it was a pretty funny example because it's, like, here I'm taking this digital thing and making it physical. A lot of people have tried pairing the blockchain with provenance for a piece of art. They are essentially saying “you have to have this token that goes with this art piece” because they're trying to take that physical art and make it digital; whereas Pepe kind of switched that whole thing on its head. We said, “here I have this digital art and I made it physical”. And what's really interesting with those OpenDime USB sticks is that you really can trade these digital Pepes, these digital items, physically because the whole idea is that the private key only exists on that USB stick and because you can actually see it by looking at it that it's not damaged in a way that would have revealed the private key, that it's secure and that you can basically trade it and feel good knowing that it's on there and the person can't steal it back once they give it to you. Jason: It kind of puts to rest the questions people have about there being no physical manifestation. Now it lives somewhere. Joe: Exactly. You can create that. Were you surprised that Homer Pepe sold for $39K? Jason: So the Rare Homer Pepe sold for $39k (350,000 Pepe Cash) at the live auction at the Rare Digital Art Festival, is that right? Were you surprised by that? Who is Buying the Most Expensive Rare Pepes? Jason: People want to tell the story that it is the newly CryptoRich buying this rare digital CryptoArt. Is that right or just a good story? Joe: Did you read that article that just came out recently? I thought that was interesting. I read that one, too, and it's interesting. People have all this money now and they aren't really sure what to do with themselves. Jason: Do you think that's accurate or do you think that's sort of like the better story for reporters to tell so they're like, "Oh, yeah, there's all these young rich young people, they don't know what to do with themselves because they made money so quick." Because it's already in crypto, it's just easy for them to buy other CryptoCollectibles. Do you think that's accurate? Joe: I think if you look at it from the fact that there’s huge barriers to entry -- you got to get the Bitcoin, you got to get the Ethereum -- so probably the people buying these things are the ones that are already into it because they know how to use it. I think it's probably entirely accurate that people like those guys in that article are the reason why some CryptoKitties have sold for over $100,000. It's like people in the art world in these smaller kinds of communities that buy art are kind of trying to impress each other. So now you've got that same thing, but in the digital world. So now you've got these guys that have gotten rich on Bitcoin, Ethereum, what have you, and they want to impress each other. I really think that that's probably pretty accurate and why you see these markets going the way they're going. And I don't see any reason why as long as Bitcoin and cryptocurrency keeps going the way it's going, gets more adoption -- I think that would just kind of be the new segment of the art world. And here's these other rich people that all got rich in this type of thing and they buy this kind of art. I think that's probably accurate. I think those guys in that article are probably the ones spending $40,000 for a Rare Pepe. Jason: Putting their kids through college and stuff. Joe: Exactly. So I'm not crypto-retired because I have to be responsible because I'm a parent. But that could change if I had tens of millions of dollars. But it's interesting that -- I think that's pretty accurate. It's just, people are crypto-rich. They definitely are. Something doesn't go up 1,000 times, but there's some people getting really rich. Jason: And since they're already part of this community and using Telegram and talking to each other, they know about Pepe and whatnot. Why wouldn't you buy within the community that made you rich, arguably, right? Winning Bidder for $39K record breaking "Homer Pepe"
Joe: And you understand it and it's not a bad investment. Whoever bought Homer Pepe six months ago probably made money on their sale, like, last weekend. So you see these things go for -- like, I remember the Jong Pepe, for example. When I sold one for 50 XCP, which was like $150 at the time, I was like, “That's a lot of money to spend on a Pepe” because no one knew. It was price discovery, right? And then one sold for just under $8,000 in July. And that's way more -- in terms of XCP, it was eight times, so not even just in terms of dollars. So, it's like some people invest in art. I'm sure you know, so it's like not only are these guys trying to impress each other; it's kind of not a bad place to park some of your money, either. Jason: Yeah, I love it. I kind of thought that but I wasn't sure. I hung out with a bunch of people at the conference and I'm like, “I don't feel like I'm necessarily hanging out with a bunch of super crypto-rich,” but I don't know if I would recognize them if I saw them. I do know that most people that I know and hang out with couldn't drop $40k on a Rare Pepe at the moment. So someone has some money. And I was surprised that the rate at which they were selling. It seems like maybe in half an hour to an hour of the auction, and I heard it cleared about $100,000 in Pepe total, I think. Joe: I don't remember, but I wouldn't be surprised if that's what it was. Jason: Awesome, thanks for your time Joe! We should grab a beer some time given you live not too far from me. Joe: My pleasure, yes let's do that. After a brief hiatus, the Rare Pepe Wallet is back open for submissions. My first Rare Pepe, HODLERPEPE was accepted on 01/27/18.